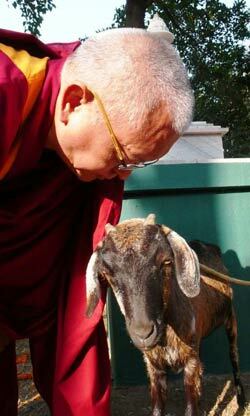 Lama Zopa Rinpoche blessing the one of the residents at the Animal Liberation Sanctuary, Nepal. Lama Zopa Rinpoche gave the following advice on March 27th 2008 in response to the critical situation in Tibet and the recent appeal by His Holiness. “The purpose of doing demonstrations is to fulfill the Guru His Holiness the Dalai Lama’s Holy wishes; this Guru Yoga practice is the path to enlightenment for the benefit of sentient beings. It is also important to repay the kindness of the Tibetan people, who have preserved the complete Buddha Dharma, not only Vajrayana but the whole path; they have preserved all the teachings for a long time. Due to this we non-Tibetans are able to receive the complete teachings, enjoy and make our lives meaningful. Go to Peace in the World for more advice. Lama Zopa Rinpoche during long life puja in Kopan, Dec 2007. This is a condensed advice for each of us on how to practice for our entire lives. Whose life goal is to achieve enlightenment and to liberate all sentient beings from the ocean of samsara and to bring them to full enlightenment. Because of that, life becomes most beneficial. “All sentient beings” means also for yourself. I pray for everyone to have a happy, healthy long life with a good heart. Our precious Guru, Kyabje Lama Thubten Zopa Rinpoche, has very kindly advised us many times on how to be a better person, how to work for the benefit of others. Rinpoche also gives advice many times on the importance of subduing our mind, developing mindfulness of our body, speech and mind. Everyone should develop this mindfulness. We should follow this advice every day. Whatever Rinpoche teaches us, we should follow his advice and put it into practice. This is very important to develop strong and pure relationship with our Guru. I request everybody to please pray for the long life of His Holiness the Dalai Lama, and that we may be able to fulfill all His Holy wishes, and help in whichever way we can. Please also pray strongly for the removal of sufferings and problems in Tibet, and for the Chinese Government to agree to sit together with His Holiness Dalai Lama to plan peace for Tibet, and for any meeting to bring success. Please don’t forget the Dharma. Remember all the mother sentient beings in your prayers as well as in your daily life. Make effort to be a person with good heart. Congratulations to Gendun Drupa Centre, Switzerland! Keeping the total number of FPMT centers, study groups, projects and services worldwide to 150. Gendun Gyatso Study Group (which was based in Brazil) is closed. With grateful thanks to all whose time, energy and donations enabled the group to benefit beings. 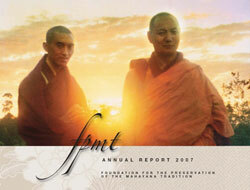 The FPMT International Office 2007 Annual Review is now available! Please go to International Office webpage and click on 2007 Annual Review. Messages from our amazing Spiritual Director, Lama Zopa Rinpoche – and recent thoughts about the organization from Osel Rinpoche! Ven Roger Kunsang shares his very inspiring attitude to serving Rinpoche and the FPMT organization. 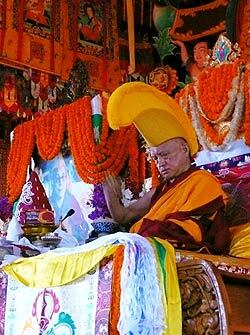 The opportunity to rejoice at the benefit offered around the world by FPMT Charitable Projects. NB: Last year, many center directors told us that they had sent the Annual Review to their members and students, and found that it helped very much to educate their members and students about the calibre and scale of the organization of which their center is a part – so we strongly encourage you to use the Annual Review in this way. This is a forum for FPMT teachers to share information and support one another. This e-group can be used to request feedback about the most skillful way to deal with difficult topics and questions posed by students, post questions to each other, share resources or ideas…..etc! If you are an FPMT teacher and would like to subscribe, please send a blank email to fpmtteachers-subscribe@yahoogroups.com. We hope it proves a useful aid to your wonderful work helping beings connect with the Dharma. Geshe Thubten Khedup has moved to Shakyamuni Center, Taiwan as their resident geshe. Geshe Thubten Soepa has moved to Lama Yeshe Ling, Canada as their resident geshe. Ven. Jampa Dekyi is starting as Tushita Meditation Centre (Dharamsala)’s resident teacher. The Stages of the Path Basic Program homestudy package is now available from the Foundation Store! FPMT Offers Food to All the Monks at Sera Je – You Can Help! In 1991, Lama Zopa Rinpoche began offering food to all the monks of Sera Je Monastery in India on behalf of FPMT. Since that time, FPMT has been raising the funds to support this project. Last year, in addition to the offering of the meals, FPMT also sponsored the building and equipping of a new kitchen for the monastery. Presently, FPMT is offering three meals a day to 2,700 monks, nearly three million meals a year! The projected budget for the upcoming year is $324,000. For more information on the Sera Je Food Fund or to watch a beautiful video documenting the food fund, visit the Sera Je Food Fund project page (where you can also donate to support this amazing project). Lama Zopa Rinpoche with Song Rinpoche earlier this year. tradition (“Jang” means “winter” in Tibetan) that extends back to the time of Lama Tsongkhapa, when the best students from the three largest Gelug monasteries – Ganden, Sera, and Drepung – came to debate texts of Buddhist logic. At a minimum of seven hours of debate per day, sometimes continuing through the night, they sought to hone their reasoning skills and deepen their understanding of the teachings. In 2007, FPMT was able to sponsor the food and travel for over 600 monks to attend the Jang debate! For more information, visit the Lama Tsongkhapa Teacher’s Fund page. Opportunities include Root Institute’s Shakyamuni Buddha Community Health Programme in Bodhgaya is looking for a Physiotherapist; Milarepa Center in Vermont, USA is looking for a cook and house manager and a land manager, and Mahamudra Center, New Zealand is seeking a manager and gardener.